A thesis presented in partial fulfillment of the requirements for the degree Master of Fine Arts in Graphic Design in the Graphic Design program at Vermont College of Fine Arts, Montpelier, Vermont. The queer experience is a constant battle both personal and societal. This invisible war that has seen far too many fall victim has also inspired important art and design throughout the ages. This thesis entitled “Gay and Tired” attempts to highlight the experience of queer design as practice, contextualize the queer experience within the bounds of heteronormative history, and highlight the impact of queer artists on the development of art and design. Queer design is not merely the made but in the making. This is a thesis that both exists as a product and a memento mori for the process of queer creation. "I believe historical and social context is key to understanding human behavior and cultural output such as design. No artist or designer operates entirely within theirself. Even stories of feral children usually include an animal caretaker of some sort—contact is inevitable and necessary for human survival. Queer design presents a problem because heteronormativity leaves most culturally illiterate when it comes to queerness. Queer history is a niche only sought out by those that are interested; usually that means queer people. Queerness is not usually included in the main narrative except where it is unavoidable or serves the heteronormative purpose. The AIDS crisis, for example, is well known but only a sympathetic tale of human tragedy or in so far as it serves a cautionary tale about promiscuity. The mechanisms behind the epidemic—governmental apathy, unequal access to healthcare, etc...—and even the basic facts surrounding HIV and AIDS are less understood. This book provides a overview of queer terminologies, histories, and cultural icons. By its nature this is a non-exhaustive list and the briefest of overviews. 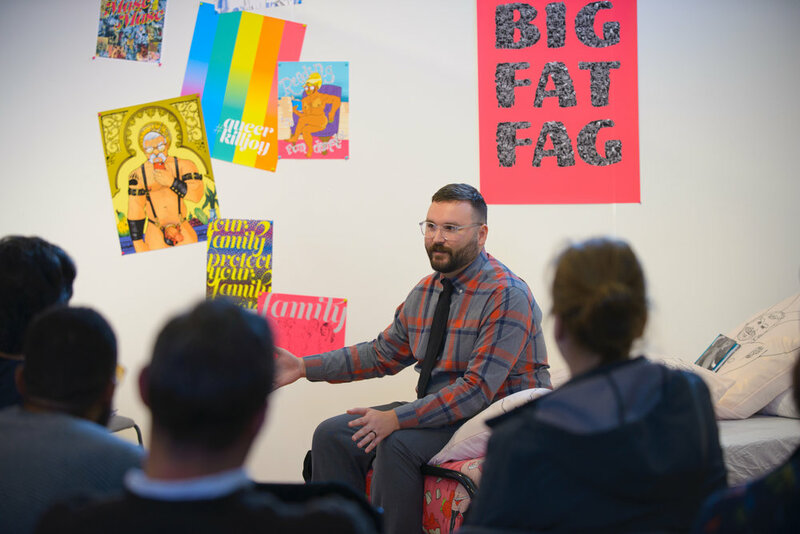 It is meant to serve as a baseline context for queer history and design. Each letter also represents a talking point for my own thoughts on the queer condition, my interpretation of its importance, and the impact it has had on various creative arts including my personal work." "When it comes to history, we seem to operate on a straight until proven guilty system. Afterall, President James Buchanan could have meant any number of things when he wrote, “I have gone a-wooing to several gentlemen, but have not succeeded with any one of them,” to his ex-roommate William Rufus DeVane King after their separation, but claims to the first gay or bisexual president are relegated to think pieces not history books. To declare someone queer who did not—read could not—identify as such is controversial or even offensive to many. A queer history is seen as revisionist history. Of course we are all accustomed to viewing history through a specific lens. We are taught that Christopher Columbus discovered the Americas, though the land was obviously already inhabited. We have Pilgrims fleeing religious persecution and colonists, not conquerors. The fact that Chinese moveable type predates Gutenberg is often only a footnote. History is never neutral. It is influenced by the perspectives and biases of those that record it, read it, and teach it. Queers are denied a history because we typically view it through the lens of heteronormativity." "Queer people are told it is better to hide themselves, better to live on the fringes, and safer to lie. The bullies past and present teach us to be hard and guarded. We become hyper aware of how we move through the world. The way we speak, act, dress, who and how we love puts us at risk, but there is a greater psychological danger to hiding. We do not choose to be queer, but self-expression for queer people is a radical, conscious choice. It is not an easy decision to make and continue to make living in a society that is increasingly hostile towards all deviation from the dominant culture. Living in this constant state of hyperawareness is both exhausting and terrifying. We are living in an era where the author has been revived. As someone who has always struggled with doubt and uncertainty when it comes to any for of self-expression—in my work, my social life, and with my family—I have become preoccupied with using design as a means of sharing my thoughts and revealing the beauty of queerness. I am inviting the audience into the world hidden from view and precious. While I believe work has life outside of its author, familiarity with the author’s point of view and life experience contextualizes the work outside of the viewer. In fact, queer design is not merely the product but the act of producing. It is imperative to reveal the story behind the work, to lay bare the story of author or else the spectator runs the risk of missing the queerness." This exhibition creates world where queerness is celebrated, imagining artifacts collected over the adolescent life of a queer individual before leaving home. It is a time capsule of a life that I did not live but hope can exist in some form for queer youth of today or the future.